I arrived at Medicine Bow Lodge just before lunch. The smell of cinnamon buns and barbecue wafted through the air, as we entered the main lodge and were greeted by the friendly ranch dogs. Dating back to 1917 and resting upon a rushing creek, its old log walls and large stone fireplace give the space a warm and cozy feel. We’d be dining with the rest of the guests on a scrumptious home cooked meal of barbecue on homemade biscuits with crinkle cut fries before heading out to meet our mounts. 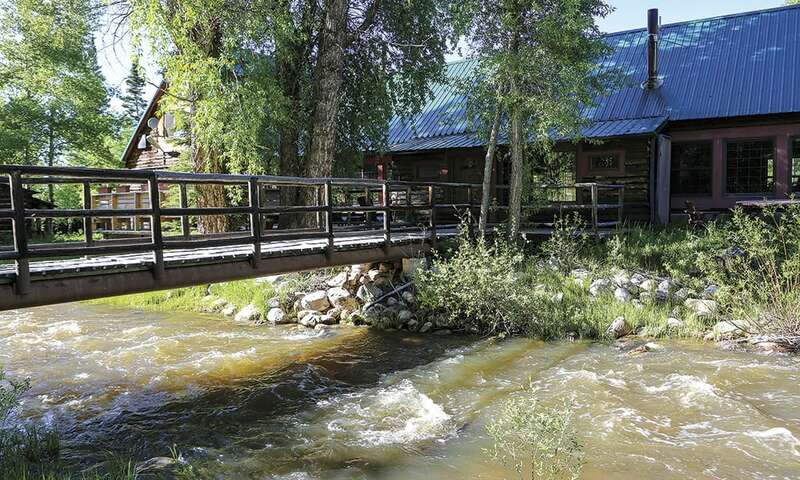 Run by Tim and Debbie Bishop, Medicine Bow Lodge is celebrating its 100th anniversary. 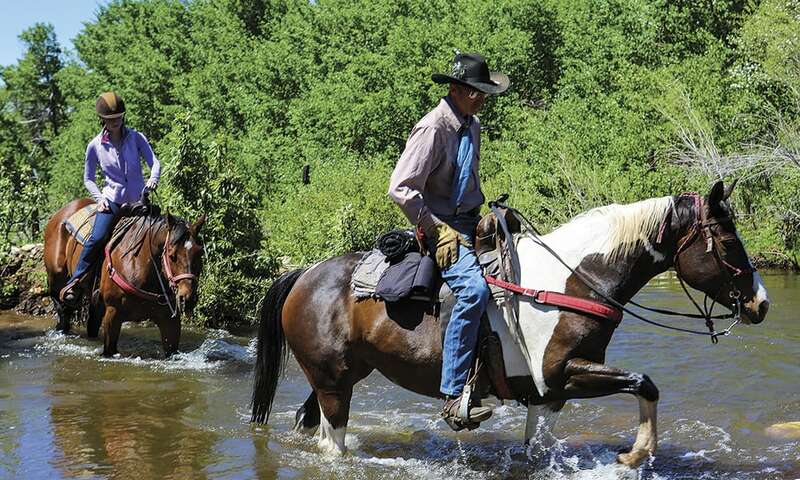 A dude ranch that can last that long is special in itself, and upon a visit to ride, eat and enjoy this historic property, a longtime member of the Dude Ranchers Association, I was able to take a deeper dive into its unique charms. The main lodge at Medicine Bow. 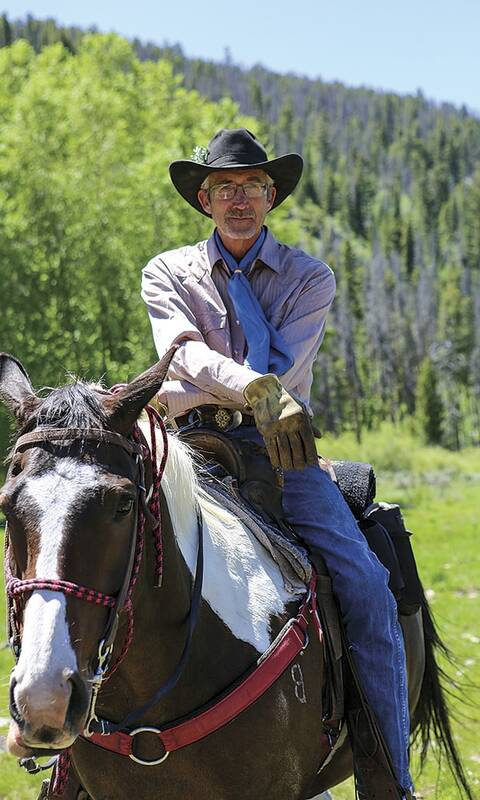 I saddled up on a twelve year old bay horse while owner Tim Bishop rode his sassy mare, Millie. We set off from the stables to a nearby glacial carved valley dotted with colorful wildflowers and sage. Tim pointed out Wyoming’s state flower, the Indian Paintbrush, and grabbed up some sage for me to smell. It smelled surprisingly strong, nothing like what you’d buy at your local grocery or even grow in your garden. I relaxed as we meandered onward, crossing a babbling brook, beaver dams and chirping birds, on our way to higher ground. With over one million acres in southeastern Wyoming, the Medicine Bow National Forest was designated as a national forest in 1902. Named after the Native Americans who held powwows, performed healing rituals and sourced rich mahogany wood for their bows in the forest, today its diverse terrain, including the dramatic peaks of the Snowy Range attract those looking to take in scenery, driving the Snowy Range Scenic Byway—which I’d do later in my trip—or hitting secluded trails with folks like Tim Bishop. Wildlife abounds here and as I rode deeper into the forest, I truly felt a world away from my busy, city life back home. At one point, we reached a long straight trail between the trees with a gentle rise—the perfect place to ride fast. We cantered along, feeling a bit of a rush, before entering a meadow in the woods and what seemed like a private oasis. It’s here that Tim relayed what he likes best about his job and life away from civilization—talking about the changing sky, the trees and the sheer vastness of this area that he is free to explore day after day. I could feel his passion as he spoke. “You know, everybody ought to have a job like this,” Tim said as he smiled, and I smiled too. Yes, everyone would be lucky to cowgirl up and experience just one ride like this, let alone a lifetime of it. It’s riding places like this, trails within our public lands open to riders, that make me want to cherish these exceptional places for generations. If you’re looking for an off the beaten path adventure in the wilds of Wyoming, take a look at Medicine Bow Lodge and the Medicine Bow National Forest. 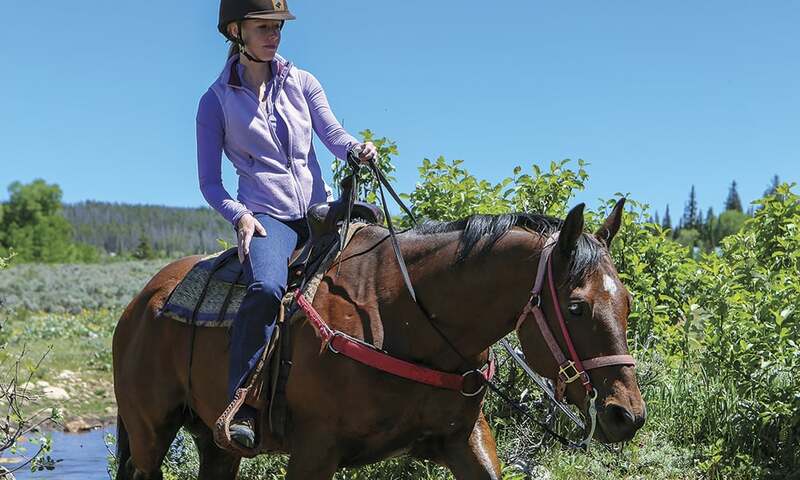 While we visited the lodge to ride horses and soak in nature in this stunning and remote part of Wyoming, others come to relax, fish, hike and enjoy the vast national forest within the ranch… and that’s pretty a pretty cool way to spend some time away.